I have been meaning to continue with my “Wandering with me in Aotearoa” posts, and indeed I will. The next couple of these posts will be of interest to an online buddy of mine from the Children’s Hub as she has been eagerly waiting to hear of the Myths and Legends from my country. So I am delighted to bring you a picture book of the Legend of how Wellington Harbour (our capital city) was created. Opening Sentence: In ancient times in Aotearoa, there was a beautiful lake in which there dwelt two monstrous taniwha. Their names were Whataitai and Ngake. Synopsis: Whataitai and Ngake lived happily in a lake until Ngake got bored and decided to break free to the ocean. His actions splitting the land in two and those of Whataitai who was left to mourn after Ngake had far reaching consequences that can still be seen today in the shape of our capital city. 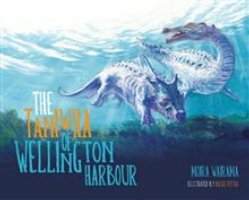 Why I like it: This is a delightful Maori legend about the shape of Wellington Harbour and the mythical creatures that once called it their home. Children will also delight at the pictures which portray the Taniwha like ancient dinosaurs. The text itself has also been laid out in an interesting manner for young people. The book is available in both English and Te Reo options and the English version not only teaches young readers a bit about Maori myths, legends and history but also some of the language. While Moira delights us in retelling a legend told to her over 30 years ago, Bruce’s blue hue illustrations bring the taniwha leaping and thrashing off the pages. This entry was posted in 12x12in12, Aotearoa, Picture Book Review and tagged Aotearoa. Bookmark the permalink. Thanks for posting books by local authors. I really enjoy your choices and the chance to learn more about NZ culture. Thankyou Julie. Over the next few days hopefully you willl find it a treat here. This looks like one that would appeal to the dinosaur lovers in our midst! Thanks for a great recommendation, Diane! Oh yes any dinosaur lovers will enjoy this one I should think….lol. I really love it when you share books from NZ. Love this ancient folklore. A story you no doubt heard about as a child. Love the cover! Nice choice! Thankyou Pat, so pleased you enjoy these. I am hoping to share a bit more about my country over the next few days. Cooper has just been asking me about gods and godesses of other cultures like those of Greece and Egypt. This folklore might help some of our discussions. Thanks! You willl find our folklore a little different from the usual ones from europe etc… But there should be some of great interest for Cooper. I will be sharing another book next Friday and also there will be a couple of interesting posts coming soon in the “Wandering with me in Aotearoa” series which you should find interesting. I LOVE mythology! I would like to know more about the Taniwha(s)! I will try to find it at the library! Taniwha the sea monster…. lol. You should be able to Google it and find more about it Erik… Glad you love this. Another interesting book. Thanks for sharing this. Thankyou Vivian glad you are enjoying this. Oooo, I would enjoy this one, Diane. I love the sound of Maori words two. Of course I first hear some at rugby matches when the Allblacks chant the Hakka! Like Kirsten’s boys, I so like to read of myths beyond the standard Greek, Roman, Egyptian and South American! Great book choice for us! Glad you like this Joanna. Stay tuned there is more….lol. What an amazing country you live in. I loved the story.When I went to youtube to hear the song memories of my school days came flooding back to me. We did a project on New Zealand with a group of student teachers in my last year of primary school, we learned that song,Po Karekare ana some in Maouri and some in English and from then on I told everyone I was emigrating to New Zealand. Billy Connelly a Scottish comedian has tour New Zealand for a Tv show and what a great show it was ,we saw the hot springs and mud baths and much more and he sang that song at the end of the show it always brings tears to my eyes it’s so beautiful. So you made me cry at 8:30 this morning. wow! So you actually did a project on New Zealand, how cool. Tune in there is more to come that will have you reminising some more… Thanks Anne.